راست‌بود, اصغر, وثوقی, بهراد. (769). بررسی تغییرشکل بین‌لرزه‌ای در ناحیه برخورد صفحه‌های زمین‌ساختی عربستان و اوراسیا در منطقه خاورمیانه با استفاده از یک مدل تحلیلی. 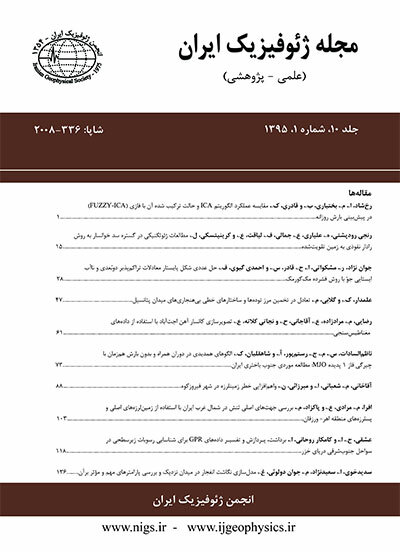 مجله ژئوفیزیک ایران, 4(2), 89-102. اصغر راست‌بود; بهراد وثوقی. "بررسی تغییرشکل بین‌لرزه‌ای در ناحیه برخورد صفحه‌های زمین‌ساختی عربستان و اوراسیا در منطقه خاورمیانه با استفاده از یک مدل تحلیلی". مجله ژئوفیزیک ایران, 4, 2, 769, 89-102. راست‌بود, اصغر, وثوقی, بهراد. (769). 'بررسی تغییرشکل بین‌لرزه‌ای در ناحیه برخورد صفحه‌های زمین‌ساختی عربستان و اوراسیا در منطقه خاورمیانه با استفاده از یک مدل تحلیلی', مجله ژئوفیزیک ایران, 4(2), pp. 89-102. راست‌بود, اصغر, وثوقی, بهراد. بررسی تغییرشکل بین‌لرزه‌ای در ناحیه برخورد صفحه‌های زمین‌ساختی عربستان و اوراسیا در منطقه خاورمیانه با استفاده از یک مدل تحلیلی. مجله ژئوفیزیک ایران, 769; 4(2): 89-102. در این تحقیق، به‌منظور بررسی نحوه حرکت صفحه عربستان نسبت به صفحه اوراسیا از مفاهیم مکانیک شکست و مدل‌سازی جداشدگی با تکیه بر میدان سرعت حاصل از پردازش مشاهدات GPS که نسبت به اوراسیا تثبیت شده‌اند استفاده می‌شود. برای مدل‌سازی از روابط تحلیلی اکادا (1985) استفاده می‌شود. نخست بردارهای سرعت با استفاده از ساختارهای زمین‌ساختی در مقیاس بزرگ که زمین‌ساخت کلی منطقه را نشان می‌دهند محاسبه می‌شوند. حتی نتایج اولیه نیز دوران پادساعت‌گرد عربستان، ایران و آناتولی را نسبت به صفحه اوراسیا و انطباق نسبتاً خوب بردارهای سرعت حاصل از مدل را با بردارهای سرعت GPS نشان می‌دهند. برای به‌دست آوردن نتایج دقیق‌تر سامانه‌‌های گسلی به‌صورت بلوک‌هایی تدریجاً به مدل افزوده شده است و مقادیر سرعت‌های لغزش و عمق‌قفل‌شدگی گسل‌ها به منظور برازش بهتر به بردارهای سرعت GPS تعدیل می‌شوند. پس از تأیید نتایج حاصل از پردازش مشاهدات GPS با نتایج حاصل از مدل‌سازی، کمیت‌های ژئودینامیکی نظیر جابه‌جایی و کرنش برای بررسی نحوه حرکت صفحه عربستان نسبت به اوراسیا محاسبه می‌شوند، نتایج نشانگر بازشدگی در دریای سرخ و برخورد مایل صفحه‌های زمین‌ساختی عربستان و اوراسیا در ایران و بیرون‌‌راندگی آناتولی و در حالت کلی دوران پادساعت‌گرد عربستان، ایران و آناتولی با نرخ اتساع در محدوده در سال نسبت به اوراسیا است. Modern crustal deformation measurements of fault systems have had a significant impact on present day tectonic studies. Unfortunately, while these measurements reveal a wealth of information about howthe Earth is presently deforming, they neglect to provide the answers regarding why. In addition, current measurements alone cannot determine future tectonic behavior of the Earth any more than they can account for deformation of the past. For these reasons, many disciplines of Earth science rely on the use of mathematical, physics-based modeling. Applied to crustal deformation studies, fault models constrained by geologic, geodetic, and seismic data can provide valuable insights into the characteristics of faults and their behaviors over time. Based on observations of the past, models can also provide estimates of future deformation and seismic hazards, a vital resource for communities living near active fault zones. In this research, fracture mechanic concepts and dislocation modeling are used to examine the type of motion of Arabian plate relative to Eurasia based on a Eurasia-fixed velocity field from GPS observables processing. Among different inter-seismic faulting models, the Okada analytical model is used for modeling. In conventional inter-seismic models, a vertical fault, extending to infinite depth, is embedded in an elastic half-space (e.g., Savage and Burford, 1973). Below the locking depth, the fault undergoes steady-state creep with a slip rate equal to the secular plate velocity. Along a semi-infinite vertical strike-slip fault, steady-state, sub-seismogenic fault creep during the inter-seismic period results in fault-parallel displacements at the surface of the Earth that are continuous across the fault. For a single vertical dislocation, as fault length and vertical width approach infinity, the fault-parallel motion approaches the solution of Savage and Burford (1973). The elements used in this modeling include rectangular elements that extend from 15 km average locking depth to 100,000 km (effective infinite depth) in an elastic half-space with a Poisson ratio of 0.25 and Young modulus of 800,000 bars. These elements show vertical structures in lower crust and upper mantle, up to the asthenosphere (Savage and Burford, 1973). Deformations are calculated using rectangular dislocations (Okada, 1985). First, the velocity vectors are produced by introducing structures that approximate the large-scale tectonics of the region. It is very important to note that primary results show the anti-clockwise rotation of Arabia, Iran and Anatolia relative to Eurasia and even show good conformity with GPS results. Hence, there is no special need to use Reilinger (2006) and Flerit (2004) dislocation elements data in modeling, and DeMets (1994) data are sufficient to prove the anticlockwise rotation of Arabia, Iran and Anatolia relative to Eurasia. To obtain more precise results, observed features of the smaller scale fault systems are progressively included with slip amplitudes and locking depths adjusted to fit the GPS data. After verification of GPS processing results with model results, geodynamic quantities, such as displacement and strain, are computed to investigate the type of motion of Arabian plate relative to Eurasian plate. Results show an opening in the Rea-sea and oblique collision in Iran, and an extrusion of the Anatolia, and a general anti-clockwise rotation of Arabia, Iran and Anatolia with a dilatation rate in the range of per year relative to Eurasia. Regarding the complexity and uncertainty of geological data, using numerical methods, especially boundary elements, is proposed for modeling. Using a boundary element method called displacement discontinuity, it is possible to introduce the slip rate of faults as an unknown and by applying boundary conditions such as stress, strain, displacement or any combination of these, kinematical modeling is extended to mechanical modeling.